Well, this is a bit of a pickle. The whole reason I bought DC Direct's Jonah Hex was because he was exactly the type of character who would never be made in DC Universe Classics. Now here he is in Series 16, and we're out of things to say about the character. As a child, Jonah Hex was sold by his father to an apache chieftain and trained in the Apache ways of war. When the chief's son challenged Jonah to a ritual tomahawk duel, Jonah broke the rules and the tribe punished him by searing his face with a red-hot tomahawk. Cast out, hideously scarred, and utterly alone, Hex rode west to make a living as a bounty hunter. He became a fugitive's worst nightmare. Seriously, there is nothing about Jonah Hex that makes him seem like he'd be a candidate for a Mattel release. He can't be a repaint, his movie was a flop, and while he's visually dinstinctive, he's not really "popular," per se. Actually, now that we think about it, it's probably that last one that tipped the scales in his favor: sometimes "that would look really cool" is enough of an excuse to turn something into a toy. 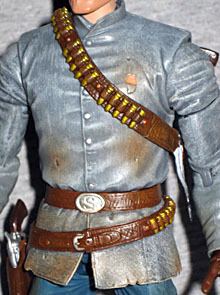 Jonah Hex uses the standard "big" body with all the costume details painted on. Ha! Just kidding, he's 100% new sculpt from his hatband to his spurs. He's wearing his Confederate Army jacket with a bandolier of bullets (done in three sets of five, and we've told you before why that's perfect), a pair of leather gloves, a gunbelt with 20 more bullets, blue jeans and boots that are a bit too square-toed to accurately be called cowboy boots. The sculpt on the coat is great - its edges are tattered, it's missing buttons and there are a few conspicuous bullet holes, including one over the heart and another near the spine. They're evidence of the hard life Jonah Hex has lived, and the close calls he's taken in the line of duty. You've gotta respect the paint apps, too, which put light rust-colored stains near all the holes, suggesting an attempt to clean out dried blood. And then there's the face. DCD's figure was meant to look like specific old art, which meant the scarring wasn't too extreme. The Horsemen have no such restriction, though, so this is Hex as you expect to see him! The right side of his face is all torn up, the skin looks burned, and he has the slightly oversized eye. The hair being so blonde is unexpected. Jonah has two accessories - yes, that means his hat is not removable. Let's all have a collective "awwww." Instead we get a pistol, which doesn't quite fit in the holster on his hip as well as it could, but still fits in well enough. It just sits up a little high, that's all. He also has a shotgun, which stores in a loop on the back of his bandolier. That makes us think, though: he's got bullets on his bandolier, bullets on his belt... where are his shotgun shells? Or can't he reload that one? Both hands are molded with the trigger finger extended. Series 16 doesn't have those silly DC 75th Anniversary collector buttons, but it does have a build-a-figure: this time, that BAF is Bane. Jonah comes with the left leg, which comes up higher than his waist. Black pants, black boot, but the eyelets that hold the black laces are all given individual silver apps. Oh, and surprisingly, there's a joint at the top of the boot, not just one in the thigh. Jonah Hex is a great figure to look at, and that was probably the idea behind his creation. Whether he seems like a typical DCUC figure or not, he's better than DC Direct's attempt was - if nothing else, it has a waist. He can hold his weapons well, the sculpt is killer and the paint is very well done. 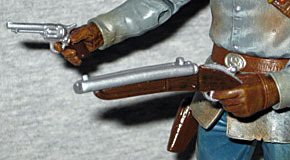 Yes, the guns are made from soft PVC, so they can warp a little, but overall, this is the Jonah Hex you want.